I’m so glad that it’s Wednesday…because that means it’s also What I Ate Wednesday! This is of course the day of fun concocted by Jenn at Peas & Crayons. The day when all the fun kids show off what they’ve been eating all week. Be sure to stop over at Jenn’s place when you’re finished here to see many more wonderful, yummy things! 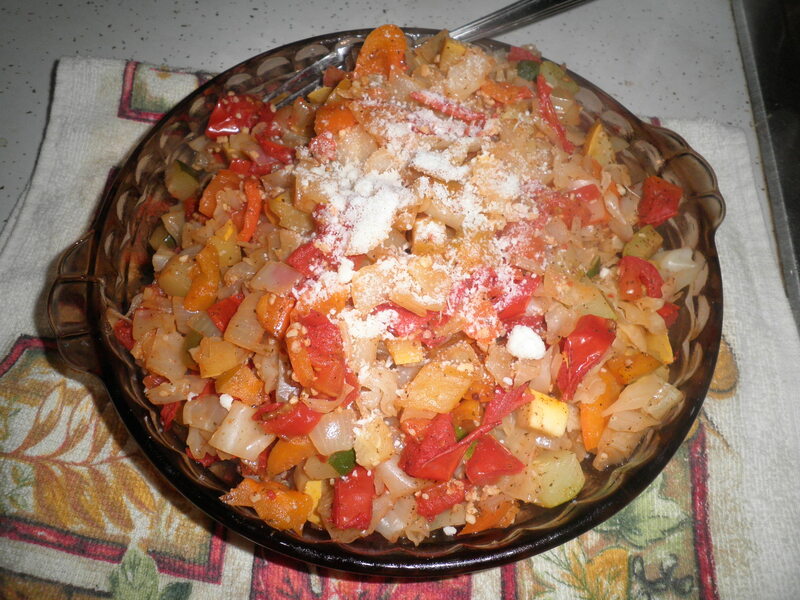 A yummy veggie combo of tomatoes, zucchini, yellow squash, onion, garlic, cabbage and spices. All served on a bed of couscous and topped with Locatelli cheese. I was just starting to feel better when I had this. I think it helped me turn the corner. Sunday’s breakfast egg sandwich on a sandwich thin. 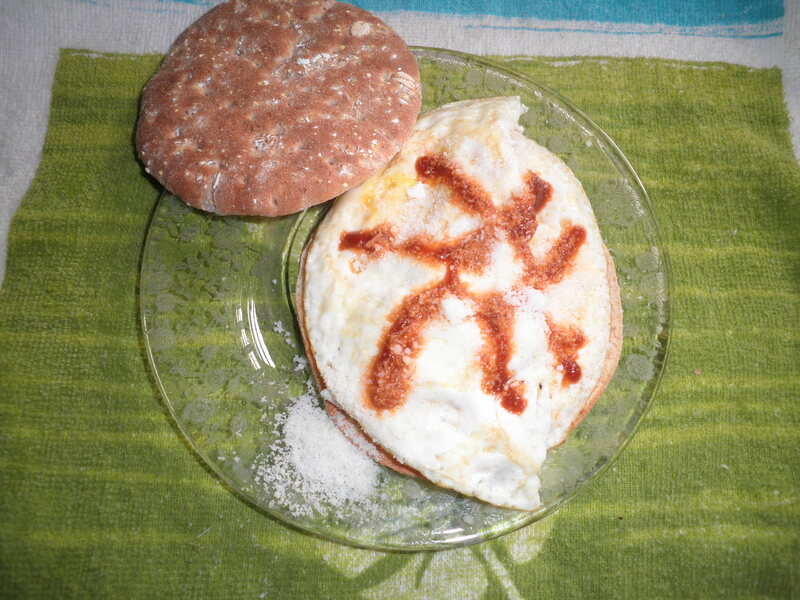 Tried to turn the sriracha sauce into a sunburst but it looks like an escaping alien instead! Sprinkled with Locatelli cheese…I don’t have good aim in the morning. 😉 It tasted good, regardless! Too funny! I’m trying Not to! Sunday night found me having the LAZIEST meal Ever! Realized I still had some of the veggie soup left from last week. Directly in the container it was stored in, I added some additional spices, a little water, a half cup of dried couscous and microwaved! 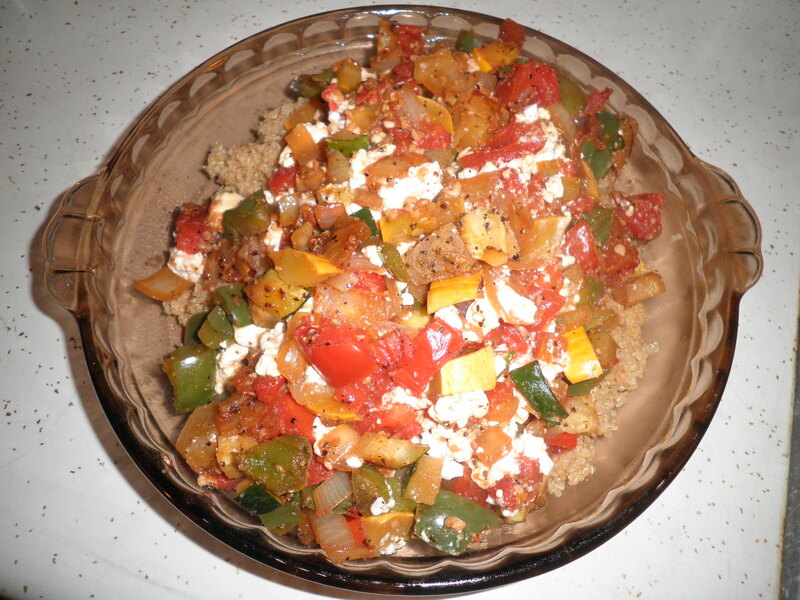 The couscous plumped, I added some Locatelli cheese on top and called it dinner…It was Very Good! After saying I was going to do it for at least 3 weeks, finally remembered Sunday night to put steel-cut oats in the crock pot. This was the result. I was so excited. 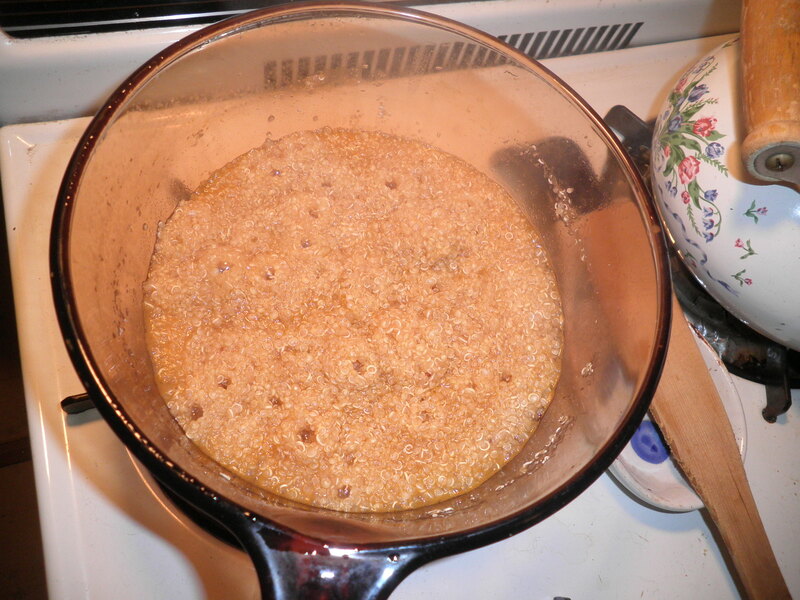 Monday night I had to go out for a short while, but I thought in advance and cooked up a batch of quinoa before I went out. Next time I’m going to try either the crock pot or wonder of wonders…open up the rice cooker that I bought and haven’t used yet. Then I don’t have to watch it so carefully! 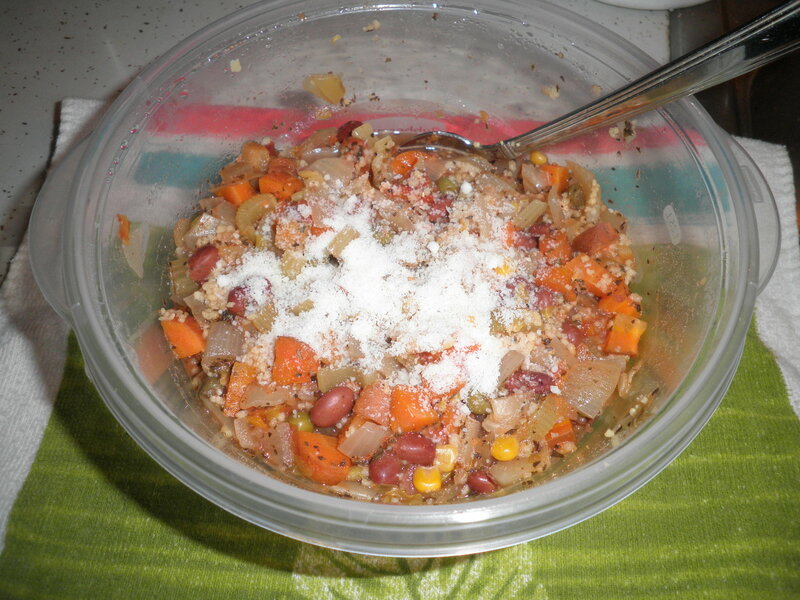 Ladled it over the quinoa and called it supper…Yum! I love having my oatmeal ready in the fridge only needing to be microwaved. I forgot to mention earlier that I divided into 5 servings. While I was rummaging in the fridge, I realized that the apples I had made in the crock pot about 2 (maybe 3?!?) weeks ago were still in there and more importantly still good! 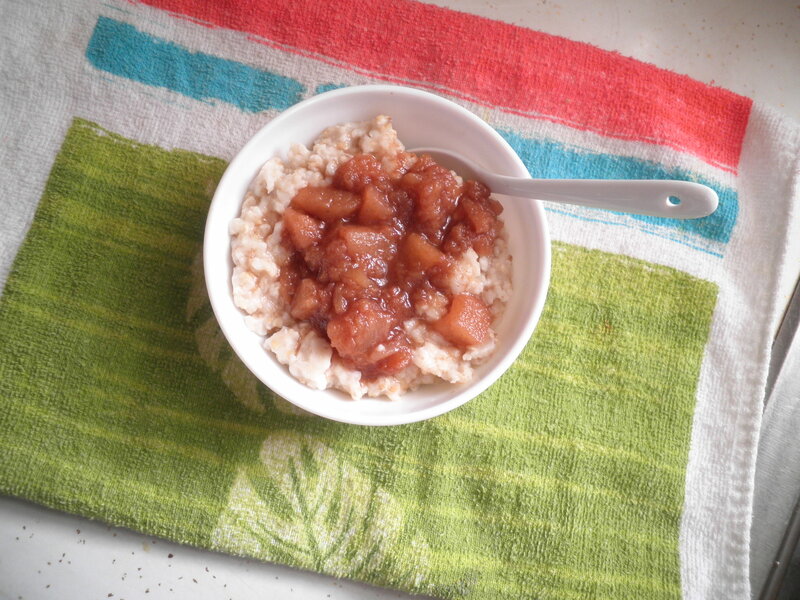 Love the combo of the crock pot apples and the crock pot oatmeal! I think this will have to be breakfast tomorrow too! There you have WIAW for this week. Much more food than I’ve shared in a Long time! Be sure to check out all the fun waiting for you over at Peas & Crayons and be sure to leave a comment…we all love your comments! Happy What I Ate Wednesday! This is what being Human feels like! This entry was posted in Uncategorized and tagged crock pot, veggies, WIAW. Bookmark the permalink. Look at all those great veggie stuffed dishes. You’re making me salivate, and I’m so happy to hear you’re finally on the mend. Good for you, and even though you’re trying to abstain/moderate, sometimes a good old scoop of PB is exactly what you need. Practicing the “sometimes” and “one” scoop is the hardest part though. 😉 Happy WIAW. Meghan, you’re so right about the “one”scoop…I have the same issue with cheese. Now that I’m feeling stronger with the PB, I’m goin to start working on cheese. Glad you like my veggie dishes. Yes..feeling beter is a good thing! what an interesting mix of foodie pics, fran! glad you are feeling better and food is tasting better! i love pb (or almond butter) from the jar, but sometimes it is impossible to stop at one spoon! have a great pre-thanksgiving day! Thanks, Cathy…that’s why I’ve been trying to curb the habit…I can’t control it. Feeling much better. Have a great day! Sandwich thins are the best things ever! My husband eats white bread…yuck…I always have both Sandwich thins and white bread. 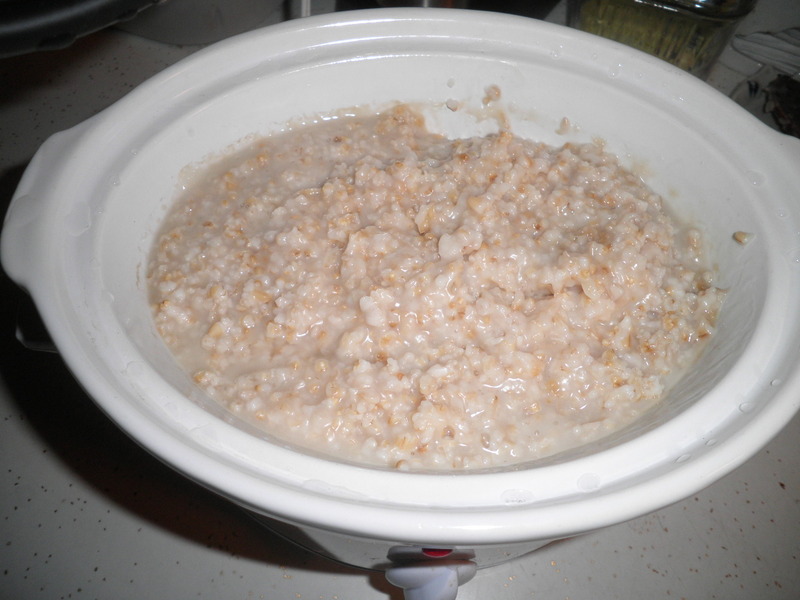 I love crockpot oatmeal and often I make it with the apples and cinnamon in there. Tastes like apple pie. I bet yours did the same! I can’t believe you had blueberries that lasted this long. I’d have been in heaven! Hi Carli! Thanks for stopping by! I love the sandwich thins too, great substitute for bread. 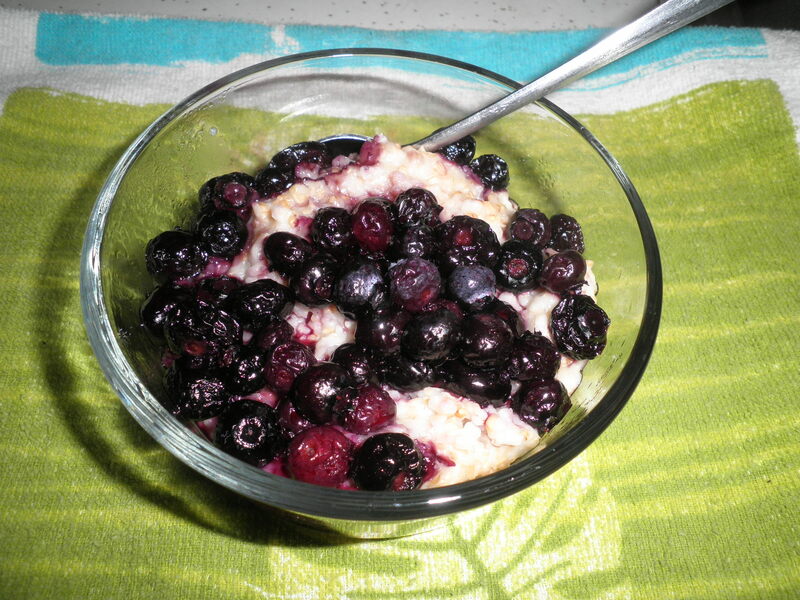 I love the crock pot oatmeal, but then, I love the crock pot for everything! Please visit again! Is it totally weird that I sympathize with your lack of frozen blueberries now? Definitely a to-do for me next year. I’ve never been blueberry picking in my life! Hi Madison! I didn’t pick them but the local produce market had them Very cheap. The is also a blueberry farm about 20 minutes from here where you can buy a ton of them. I think that will be my plan for next year! Happy Thanksgiving and WIAW! I love all your different veggie based meals. 🙂 Your are lucky to find farm fresh blueberries. Our blueberries are always so expensive. Happy Thanksgiving, Jennifer! The fresh fruits and veggies are one of the best things about living in NJ! Thanks, Mass!! Happy Thanksgiving to you too! I love the look of your veggie dinner plates; I had the same thing last night, just a huge plate of veg and goats’ cheese, so good! 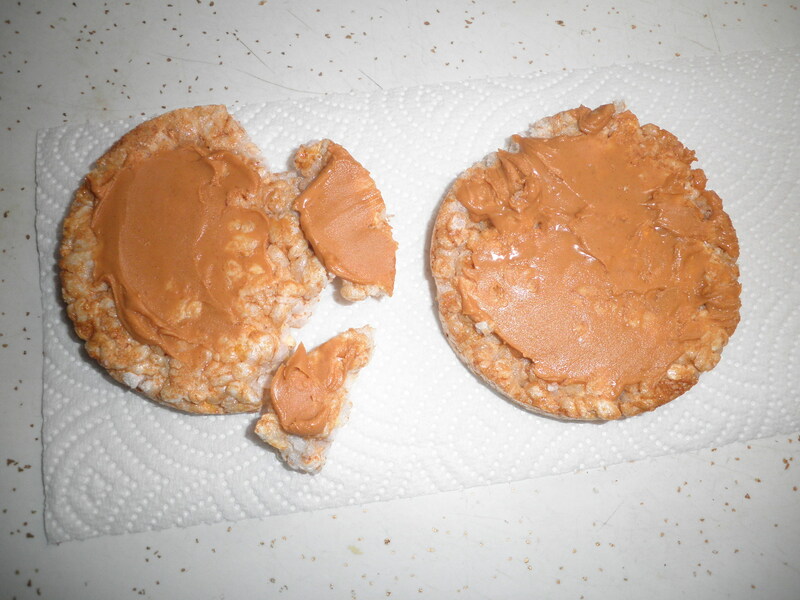 I love caramel rice cakes too, with coconut butter and strawberry jam, perfect. Hope you have a lovely Thanksgiving! Thanks, Eleanor! I love my veggie mega dishes! So filling and warming this time of year. We’ll all be together for Thanksgiving and that’s the best part!